The wind has been blowing hard since yesterday afternoon. Today is recycling day for parts of Ludlow and many other areas. And once again, we are seeing the all too familiar scene of plastics and tins being blown from the recycling boxes and littering the streets. What is Shropshire Council planning to do about this? Absolutely nothing. The plastic boxes provided by Shropshire Council for recycling are open topped. That means that once the wind picks up, and it does that quite a lot around here, plastic bottles and trays and aluminium tins are blown into the streets. We already have a problem with litter and Shropshire Council’s arrangements for recycling just make that problem worse. This is not an insoluble problem. The recycling boxes could have lids. My colleague, Councillor Heather Kidd, has pressed the council to provide lids but she didn’t get a response from the council at all. A significant contributor to litter on residential streets is plastic blowing out of recycling boxes on collection day. What plans does the Council have for introducing wheelie bins or other sealed containers to reduce this? Plastic has been collected from boxes for the last five years and while some material is blown out of the boxes, litter tonnages before and after the service launch do not suggest that there is a significant impact. Generally, residents do act responsibly and stack boxes or use other methods to prevent this, particularly in windy conditions. The introduction of wheeled bins for recycling was discussed with Veolia before the rollout of the new recycling service in 2016. However, the cost of around £600,000 p.a. could not be justified due to other budget pressures. The vehicles that Veolia have purchased for the new service can operate efficiently with bins, so if the opportunity arises in the future we can make that change. This reply never made sense. The recycling crews pour the contents of recycling boxes into a wheelie bin. That bin is then mechanically lifted and tipped into the truck’s compressor unit. So why can’t they cut out the middle operation and load wheelie bins directly? And why would that cost £600,000 a year? That’s a charge of more than £5 for every household in Shropshire. There is something seriously wrong with the council’s contract with Veolia if it costs that much to hook a wheelie bin on the back of truck. The justification for inaction, that litter tonnages have not increased, is misplaced. It takes 25,000 bottles to get one tonne of plastic. No one is suggesting that we have tens of thousands of bottles blowing around. It is unlikely the recyclables blown out of boxes will show up in a change in tonnage, especially as bottles get lighter year by year. (The council collects 400 tonnes from recycling boxes every year.) But the litter is in sufficient quantity to blight Shropshire’s beautiful towns and villages. It scars the landscape that makes this county so very special. 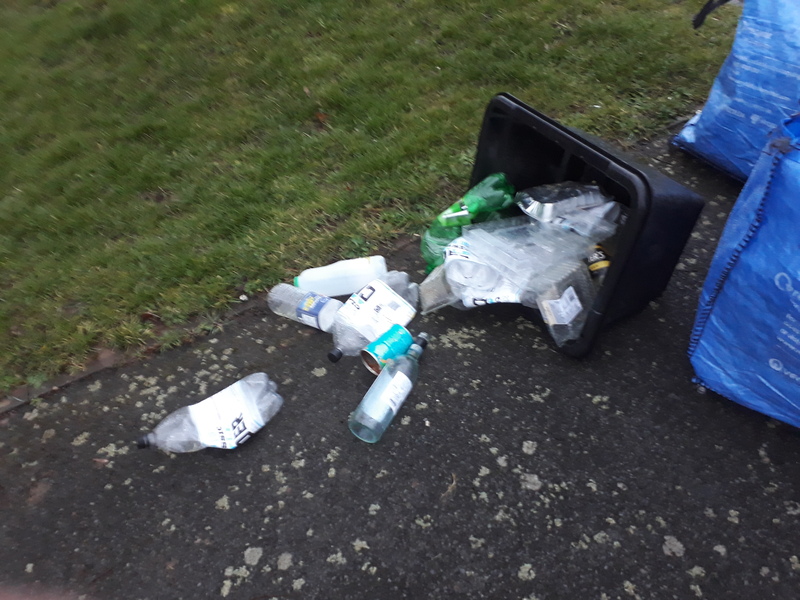 Shropshire Council is dodging the issue when it comes to recycling and litter.
. Shropshire Council spends £34.7 million a year on waste and recycling. That’s £318 a household, 24% of the average council tax bill. The cost has risen by nearly £6 million since 2013/14. They need all the money to build Mr Nutter’s (sic) airport. Why not just put the bottle box on top of the plastic’s box and that will solve the problem. Failing that, use the bag for paper to weight down the plastic. Are we not trying to reduce our Council Tax bills, not spending more money on lids for plastic boxes at a time when we are also trying to reduce the amount of plastic we use !!! If people put the heavier glass-filled box on top of the light-weight blow-away plastics box there would not be a problem on windy days! no need to go to the expense and inconvenience of lids – just educate people in how to stack! Simples! It’s common sense really !! It’s easier to prevent the plastic blowing away now you don’t have to sort the recycling as the glass bottles can weigh down the plastic. This only also provides a helpful excuse to drink enough beer to provide sufficient ballast.